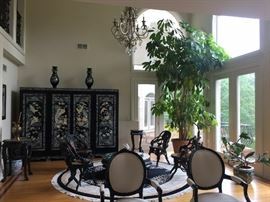 AddressThe address for this sale in Lake Forest, IL 60045 will no longer be shown since it has already ended. 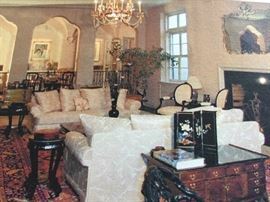 This sale in Lake Forest, IL 60045 is a "By Appointment" sale. Please see sale info below for details. - This sale is by appointment only. TODAY, SUNDAY IS OUR LAST AND FINAL SALE DAY! - HOW TO CONTACT US? 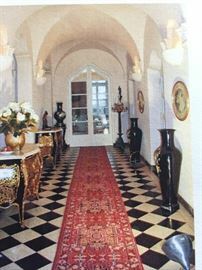 Email us through estatesales.net to schedule an appointment. Click on "Ask a Question" when signed into your account. OR e-mail us directly at: PJKLIFESTYLE@OUTLOOK.COM. Please provide 1.) Name, 2.) Phone number to contact you 3.) Item(s) interested in. Or text/call us at 262-394-7662. - Cash and credit cards accepted. For credit card sales, 3% surcharge added. - Bring truck and help or movers on DAY OF purchase. We can recommend movers. - International customers or out-of-state customers: time allotted to ship/deliver. - CC/Cash and carry DAY OF purchase -- unless international or out-of-state delivery. - All sales are final and sold AS IS. No returns, refunds, or exchanges. View carefully. - There is tight security on premise. - Please park on the street, not driveway. - Not responsible for personal or auto accidents or injuries. TODAY, SUNDAY IS OUR LAST AND FINAL SALE DAY. 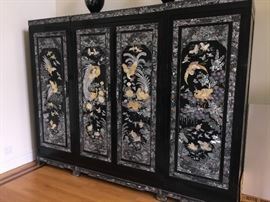 FINE CHINESE, ASIAN, KOREAN, EUROPEAN, AMERICAN FURNITURE AND DECORATIVE ARTS, ANTIQUES. THIS NATIONAL SALE IS LOCATED IN LAKE FOREST, ILLINOIS. LUXURY GOODS DESCRIPTIONS AND MEASUREMENTS IN EACH PHOTO. SEE PHOTOS. MOST ITEMS IN EXCELLENT CONDITION. ANTIQUES IN VERY GOOD CONDITION. THANK YOU TO ALL OF OUR CUSTOMERS FOR MAKING THIS SALE A HUGE SUCCESS. WE HOPE YOU ENJOY ALL OF YOUR INTERESTING, EXTRAORDINARY BEAUTIFUL PIECES FOR YEARS TO COME! Everything for sale. 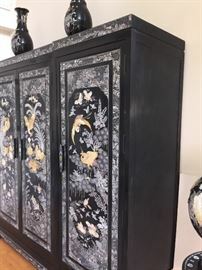 Pair of Tall Asian Black Laquered Vases with Mother-of-Pearl Inlaid Stones. Height 42 x Diameter 14 inches. Pair of Antique Bronze and Gilted Candelabras Torchiere Floor Lamp. Pair of Marble-Top French-Style Commodes. In excellent condition. Everything for sale. Oversized Art Deco Mirror above fireplace: Height 50 x Width 61.5 inches. 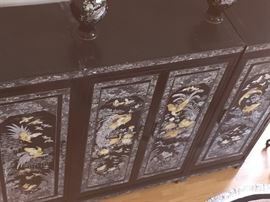 Asian Two-Sided Wood Coffee Table in forefront with brass hardware, drawers, storage on both sides. Height 18.5 x Width 42 x Depth 22.5 inches. In excellent condition. 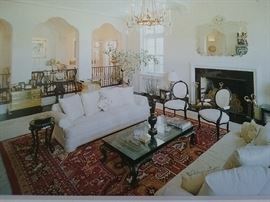 See Oversized Art Deco Mirror above fireplace: Height 50 x Width 61.5 inches. Everything for sale. In good condition. 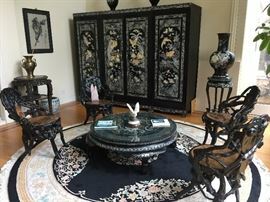 A Chinese-style Wood Carved Dining Room Table Set. 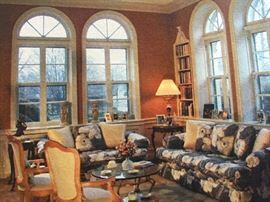 Eight chairs with creme upholstered seat cushions. Table: 9 feet 4 inches x 3 feet 9 inches. In excellent condition. Everything for sale. In excellent condition. 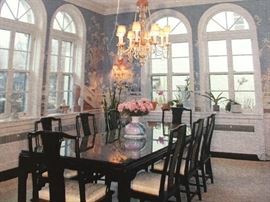 Glass Round Table with Six Sea Shell-Style Backed Chairs. In excellent condition. 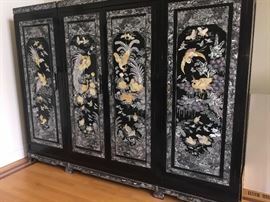 Large Asian Black Laquered with Mother-of-Pearl and Abalone Inlay 3-Piece Storage Cabinet/Chest/Armoire. Birds and Flower scene. 4 drawers, shelves and hanging bars. Height: 79 x Width 104.5 x Depth 26.5 inches. In excellent condition. A Pair of Louis XV Style Marble Top Bombe Chests/Commodes/Console Tables. Hand painted floral design and gold gilt mounts. In excellent condition. Height 33.5 x Width 45.5 x Depth 20.5 inches. A Pair of Antique Chinese Wood Carved Tables with Marble Tops: Height 32 x Diameter 22 inches. In very good condition. 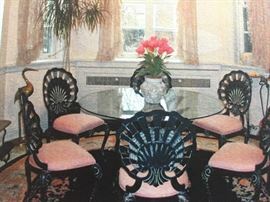 A Set of Four Black Carved Wood Root Chairs with Hand Painted Seat and Back. Chair Height: 34 inches. Seat Height: 18 inches x Width: 23 inches. In very good condition. An Asian Round Coffee Table with Mother-of-Pearl inlays. Height: 31 x Diameter 15.5 inches. In excellent condition. A Chinese Antique Eight-Sided Marble Top Carved Wood Table: Height 34 x Diameter 20 inches. In very good condition.